I have been looking for several benchmarks on a 1915 USGS topo map. For example, on the Searles Lake, CA map it indicates BM 2707 with an "X" near a dirt road. My question is, how accurate is the elevation? 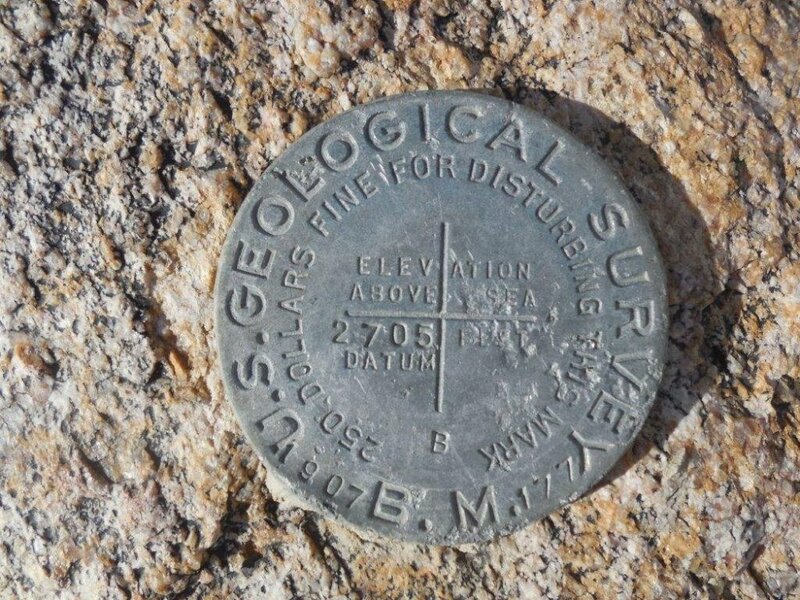 Can I look along the 2700 elevation line on a modern topo map and expect to find the benchmark nearby? Any other tips on how to find it? Wow, Dave came up with info I wouldn't have known to look for. But he didn't address the general question of old vs newer elevations. The vertical datum in use has changed over the century and I don't have a feel for how much in a given area. First there were regional datums. I don't recall when the first national adjustment occurred. The NGVD29 national adjustment was used for the modern topo maps. Nowadays most work is done with NAVD88, but continuing work may stay on NGVD29. Corps of Engineers projects and city sewer systems for example may not have converted. Next there will be the 2022 datum that relies on GPS instead of old disks. I'd suggest you try to find a mark on the old topo that is also either on the newer topo, or else has an NGS data sheet with a superseded NGVD29 elevation in order to estimate the datum shift for the area between maps. The shift is likely to be small enough to ignore for map reading, but I can't promise that. That looks like great information. I am going to try this one again. I was on the ARCGIS website where it overlays the older map onto today's contours and they look much different. Also, the road on the old map is heading parallel to, but significantly north of the existing road. Yesterday, I was looking for a benchmark (BM 1965) at the road junction named "Salt Wells" on the same map. I found an old rusted 2-3" steel pipe laying on the ground. Could that have been it, but someone dug it up out of the ground? Strangely, I have randomly found many markers out in the desert, but I have not found those on any map and the ones on the maps I can never find out in the desert. I found this one I believe is described by the post by DaveD. I am not convinced it is the same one I have been looking for shown in the 1915 topo map as BM 2707..
Google Maps location is 35.570865,-117.8400142. That is absolutely the BM X on the historical quad map. 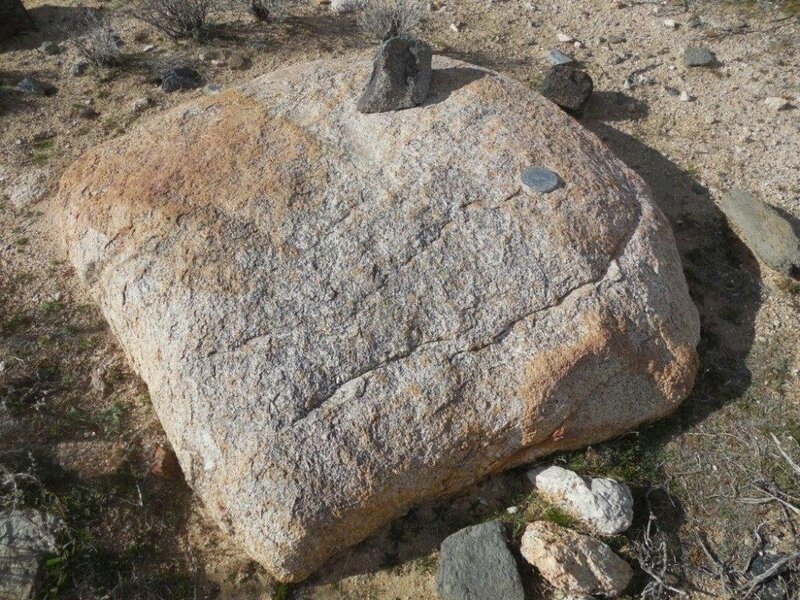 The early 1900's monuments that were attached to boulders were many times Aluminum. That is a great find and the fun is trying to these older monuments from the historical quad maps. The elevation stamped is from the original datum and almost always changed with closing loops and changing datums. That is the reason that elevations were not stamped on the monuments over time to alleviate a different elevation on the monument than what was found in the records. Marks like this set in boulders are often unreliable. I recall many years ago we were tasked by the NGS state advisor to go reset a USGS/C&GS BM that was in the way of county road major re-construction. He sent us the data (common for us (DOT) to do this), it was in our region. Long story short, the boulder was not in its original location anymore. The old narrow gravel road was now much wider with ditch, We found the mark was like this one, sitting on top of the ground where the description indicated is was partially exposed. It was clearly evident it had been pushed to its current location some time in the past during brush clearing/road maintenance etc. We still transferred the elevation per his request and leveled a mile in each direction to tie to other marks in the level line and provided him the evidence of what we found.